Home / Project Management / PMP / What Is The Most Popular Technique For What-if Scenario Analysis? After the project schedule has been completed during develop schedule process, the schedule network analysis can begin as every PMP Certification course explains. The schedule network analysis may take various forms, such as Critical Path Method or Schedule Compression. What-if scenario analysis is another schedule network analysis technique. 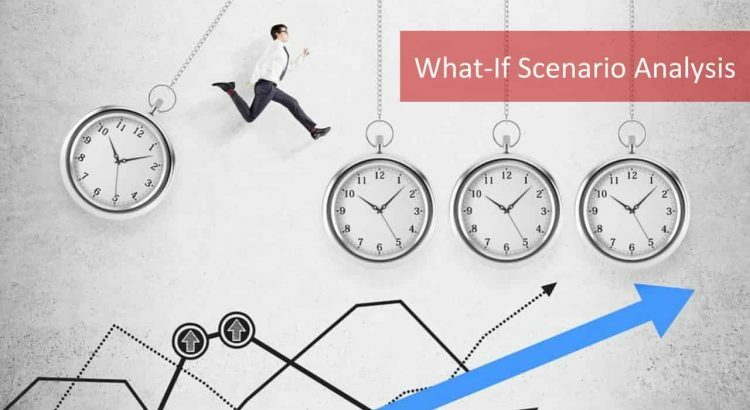 In this article, we are going to give you all the necessary details about what-if scenario analysis. We are going to see what is the most popular what-if scenario analysis technique and what are the risks of this technique. What is the Objective of What-if Scenario Analysis PMP? 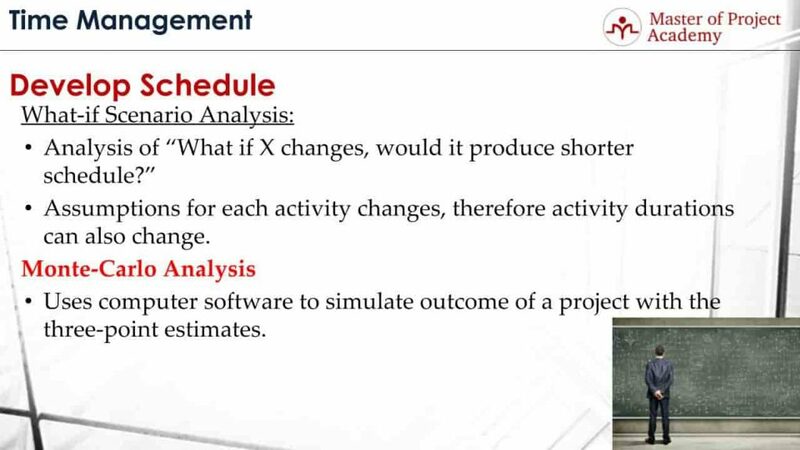 What-if scenario is actually an analysis of “what if X changes, would it produce shorter schedule?”. There are lots of parameters and factors that can affect the project schedule. We can state some of them such as risks, the experience of the activity assignee, number of resources etc. These parameters and factors are analyzed in what-if scenario analysis to check whether a shorter schedule can be produced. Assumptions for each activity changes in a project. And this affects the activity durations as well. During what-if scenario analysis, assumptions are put into play to check the schedule results as well. 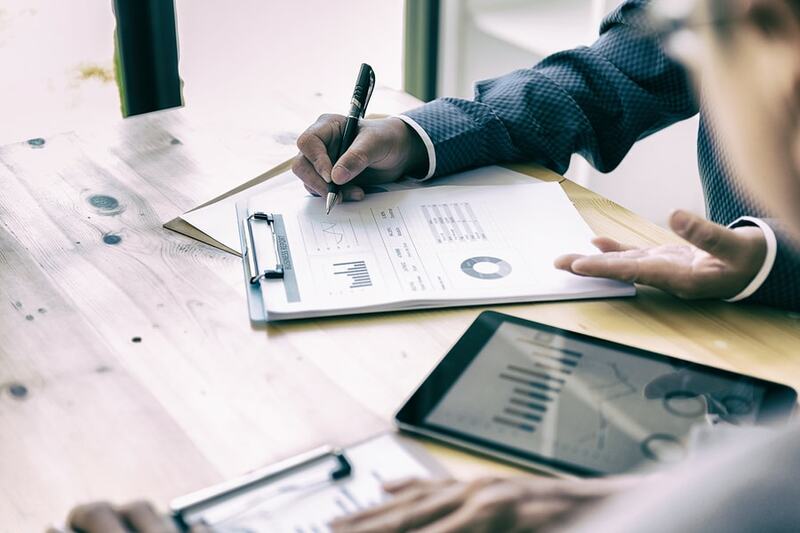 As stated in the PMP project management training, One of the most popular what-if scenario analysis technique is Monte-Carlo analysis. Monte-Carlo analysis uses computer software to simulate the outcome of a project with three-point estimates. Since there are several factors and parameters that can affect a project, doing this analysis manually will be impossible. Therefore, parameters and factors are put into a computer program, and alternative outcomes are simulated through the computer program. 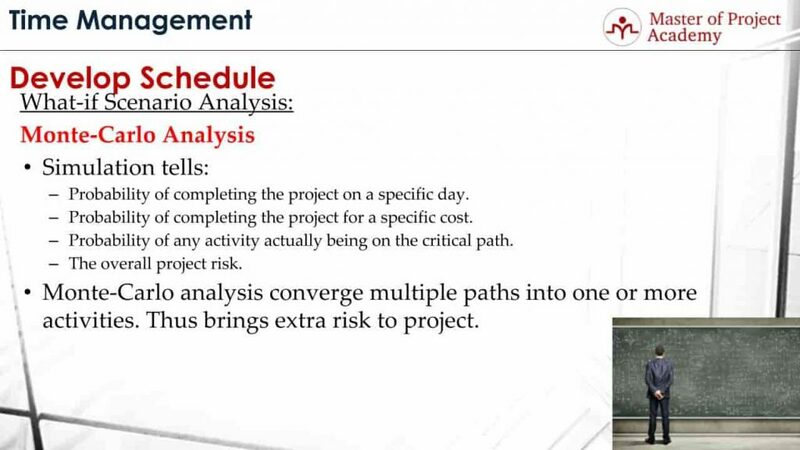 The probability of completing the project on a specific day. For instance, the simulation will give you an outcome like: the possibility of completing the project on 1st of January is 80%, the possibility of completing the project on 1st of February is 90% and the possibility of completing the project on 1st of March is 95%. The later the date, the more probable to finish the project on that date. The probability of completing the project for a specific cost. For instance, the simulation will give you an outcome like: the possibility of completing the project with a 1-million-dollar budget is 80%, a possibility of completing the project with a 1.2-million-dollar budget is 92% etc. And finally, it provides the overall project risk. Monte-Carlo analysis converges multiple paths into one or more activities. Thus brings extra risk to project. This is because of the nature of the analysis technique. We have seen the what-if scenario analysis schedule network analysis technique and gone through Monte-Carlo analysis which is the most popular what-if scenario analysis technique.